As far as Bally slots go, the Chimney Stacks one is fairly typical. You could say it's a classic slot machine game, remarkable in the fact that there is really nothing remarkable at all about it. But if you like Bally slots, you might love it. The game has a theme based around chimneys, but for the life of me I can't figure out why. Maybe I missed something and it is a brand that has been famous on TV, or a movie, or a gameshow? To be honest, I am curious about that. This is a game I have played in both Vegas and Atlantic City on many occasions. It seems to be more popular in AC than Sin City, but that is also true for a lot of games from Bally and Aristocrat too. This one has become a bit of a cult classic, if not one of the major games out there. 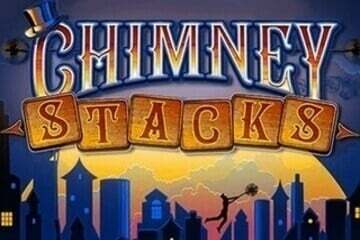 The Chimney Stacks game is a regular 5x3 slot machine, with the classic sounds and graphics that so many Bally slots seem to incorporate. The game is really popular with players that like stacked wilds. Well, you could have guessed it from the title of the game, I guess, that this game does have stacked wild symbols. In that way, it is similar to the classic game from IGT, Wolf Run, which was one of the first to ever include this feature. Other than the stacked wilds, the regular game play is pretty unremarkable, but there is plenty of attention to detail in the look and feel of the game itself, to keep it interesting and make you want to keep playing. Of course, the bonus round also helps on that front. The bonus round sees a completely new screen with new vibrant colours and lots of intense blues. The music creates a cool atmosphere, that is kind of half mysterious and the other half like a movie. You have to hear it to know what I mean. The good news is we have a free version here to play, so you can get to play the bonus round too. For free. If you hit a full stack of wilds in the free spin game, it’s awesome because that entire stack then becomes locked in position for the entire bonus game. Last time I played I got two full stacks on the first two spins, so was hitting big wins almost every spin after that - it was amazing.